We decided that for our purple bridal shower, we wanted to have an all purple dessert table. 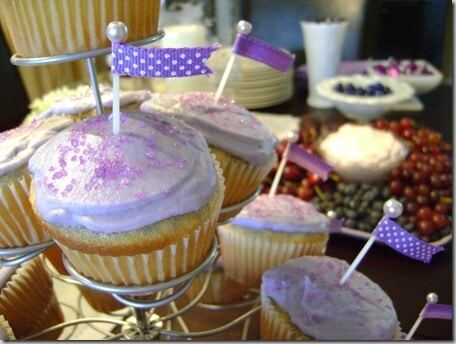 I hand made the cupcake flags from white toothpicks, assorted purple ribbons, and purple pearl beads. I love how they turned out and the cupcakes were delicious! In the background you can see the purple fruit tray my mom made with fresh grapes, blueberries, black cherries, and figs. She also made a purple dip with black cherry yogurt, and cool whip. Yum! Also included were my homemade purple marshmallows. The other item I made was individual blueberry trifles. 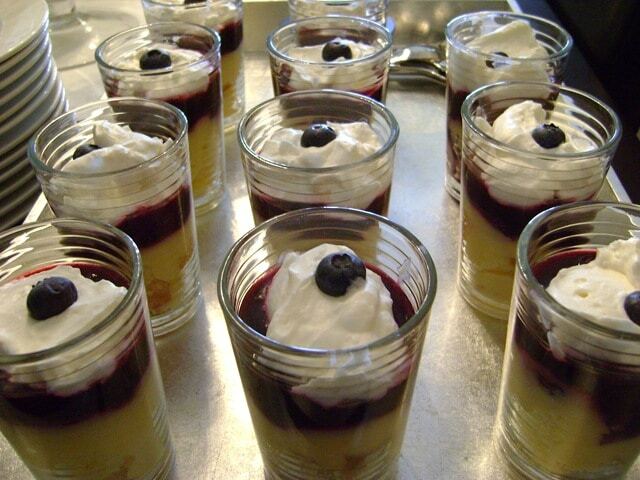 They were made in juice glasses, and consisted of a layer of pound cake, custard, a blueberry layer made of blueberries cooked in a little sugar, water, and cornstarch, and a final layer of whipped cream, with a fresh blueberry for garnish. They tasted as good as they looked! 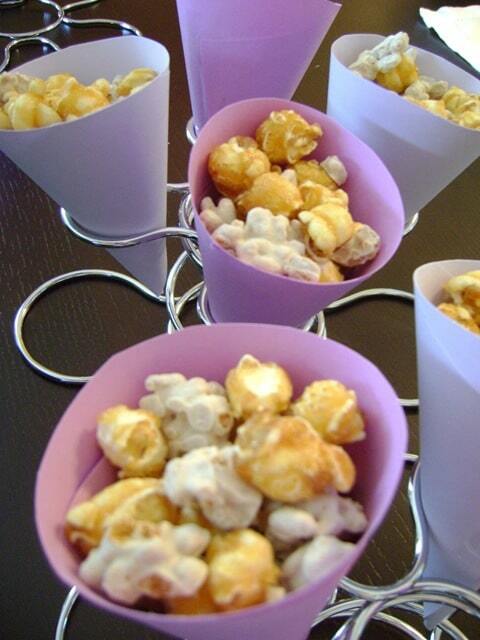 I was lucky enough to find cone holders at my local Liquidation World a few days before the party. 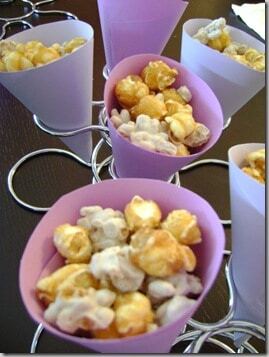 I made individual paper cones out of two shades of purple card stock, and filled them up with caramel corn and vanilla clodhoppers. 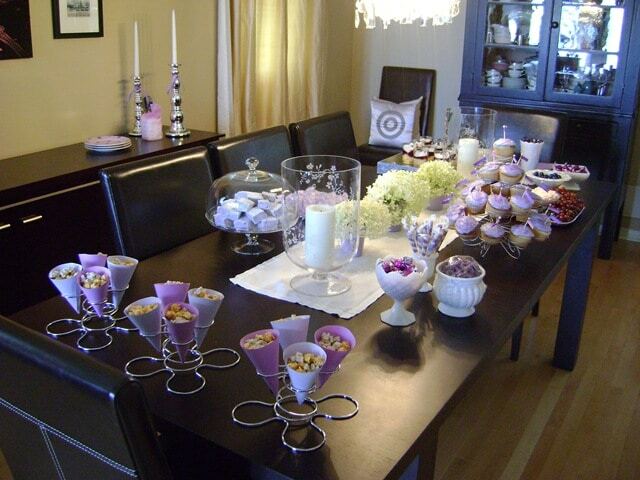 I think this is great idea when doing a colour themed dessert table, sometimes if the serving pieces are in your colour, like the paper cones, the actual food doesn’t have to be and it will still fit in nicely. 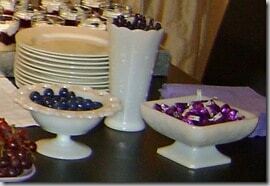 The rest of the candy was served in my collection of milk glass candy dishes, and it really helped to tie the whole look together. 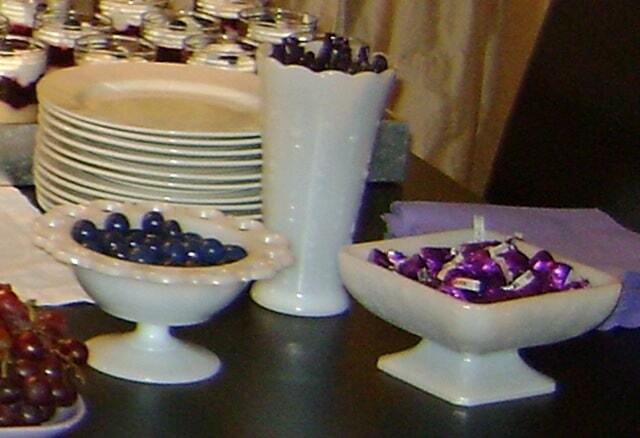 As well, the footed bowls were a great size for a small gathering. 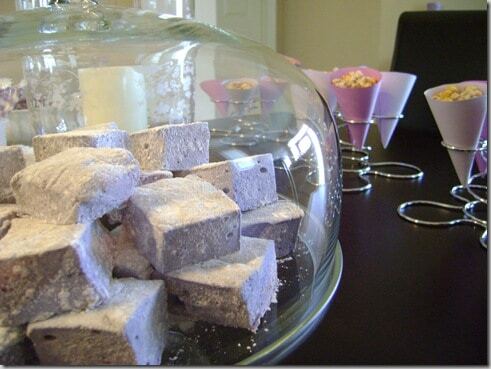 The candy we used was grape liquorice, milk chocolate truffles wrapped individually in purple foil, Hersey’s dark chocolate kisses also wrapped in purple foil, chocolate covered blueberries, and candy stick lollipops in purple. I made the chocolate covered pretzels better fit our purple food theme by melting some purple candy melts and drizzling them with it. 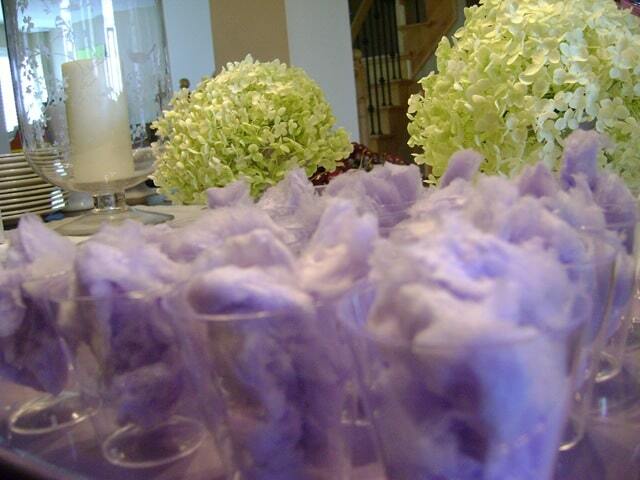 It was a purple paradise! I joined a link party here. A number of my friends have been recommending your site recently, but I never took the time to look at the beginning. Now that I’ve actually Having now read your work I must say that it is really impressive and I really hope this carries on well into the future. More often than not, it helps me get through a hard day since I use stuff I’m interested in to relax. Your site helps me to do precisely that. I am truly appreciative of that, for sure. Just a quick question, how long have you been blogging for? I’m only enquiring since I am really considering doing this myself. But really, if you don’t wish to reply, I totally understand, and I wish you the best of luck with your pursuits nonetheless. Your site is no 1! I have only been blogging for a few weeks, but I am really enjoying it. It’s a fun new hobby, and great to hear your enjoying it too. Thanks for the feedback. At the present scenario, baby shower party is very popular in mostly every European country and also in US and UK. Baby shower favors are some kind of presents that reflects the cheerfulness that new parents feel. 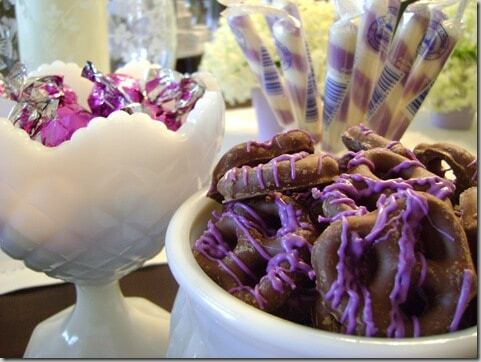 What kind of baby shower favors to make do you like? 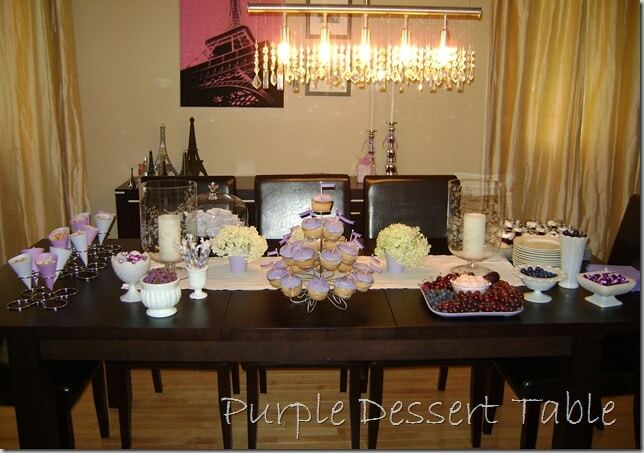 What a wonderful color to for a dessert table – it’s lovely! Thanks again for linking up! !